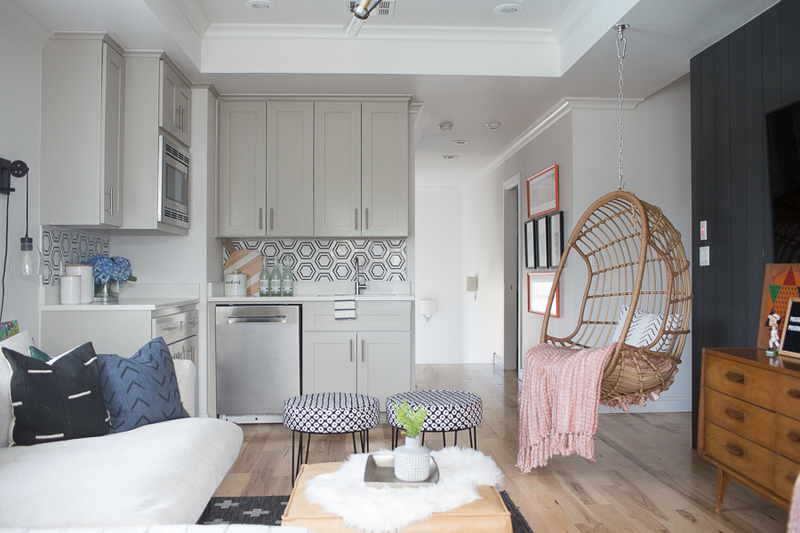 I’m so excited to share the CC and Mike Teen Hangout Room Reveal with Joybird today! 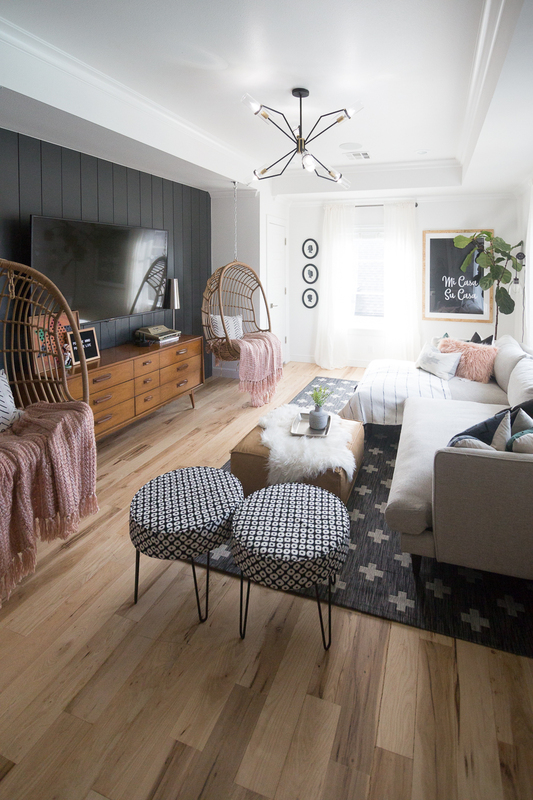 Without a doubt, our favorite room in the house is our new teen hangout room. Now before I get into all the details of this reveal, let me tell that we’ve been in our house for almost four years— which is so hard to believe — and there has been an area at the top of our stairs that has been completely neglected. I mean, completely neglected, you guys. When you walk up the stairs to our kid’s bedrooms and their area of the house, there is a small landing that I really never knew what to do with. Just keeping it real. It had me stumped from a design perspective. So, it just sat there collecting junk for over 3 years. I mean, it’s pretty embarrassing when I type it all out like that, but, at the same time, I like sharing this with you guys so that you know that everyone has unfinished spaces in their houses… even me — especially me! So what turned the tide on our little upstairs junk room? 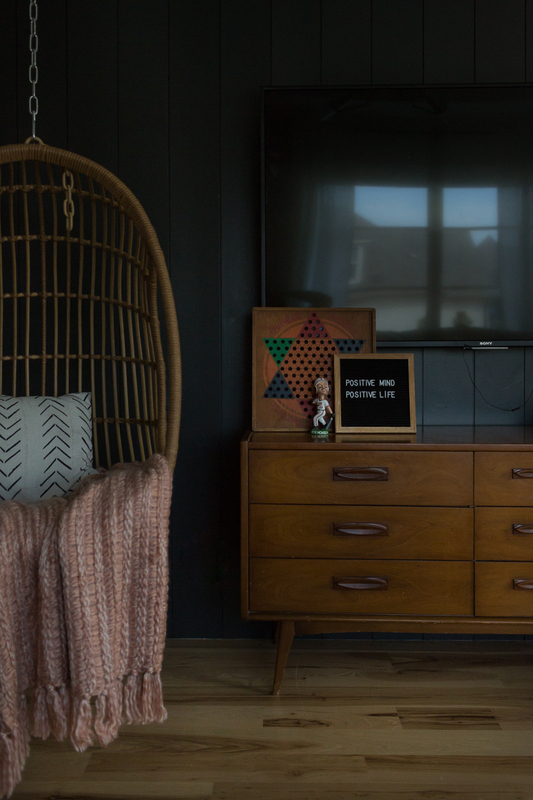 What inspired me to change it from a junked up storing all my kid’s old trophies, a broken basketball goal, and boxes of old legos and train tracks to this fun little space that is now our favorite place to hang out as a family? Yep. I know it sounds crazy but sometimes it just takes one thing to turn the tide. 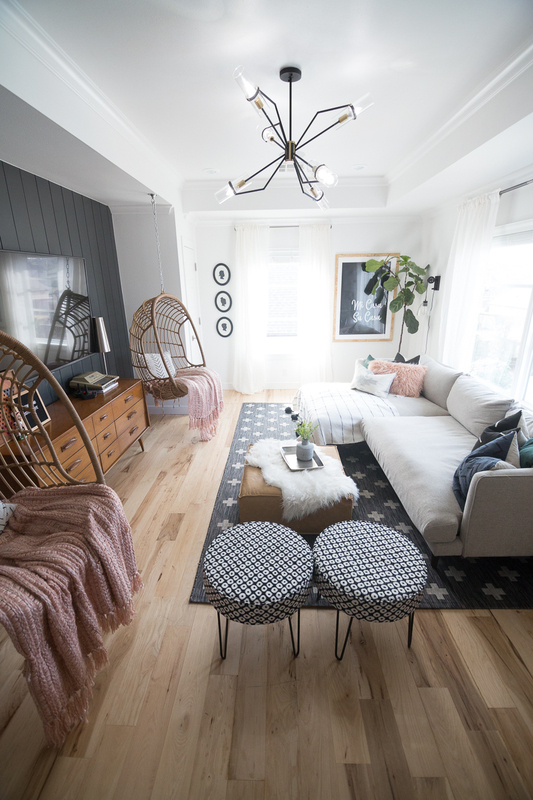 When I saw this sectional I knew it would fit perfectly in our little space upstairs. And just like that, the vision started to form of a fun, teen hangout room with a comfy, cozy couch (and trust me guys, this couch is comfy and cozy). 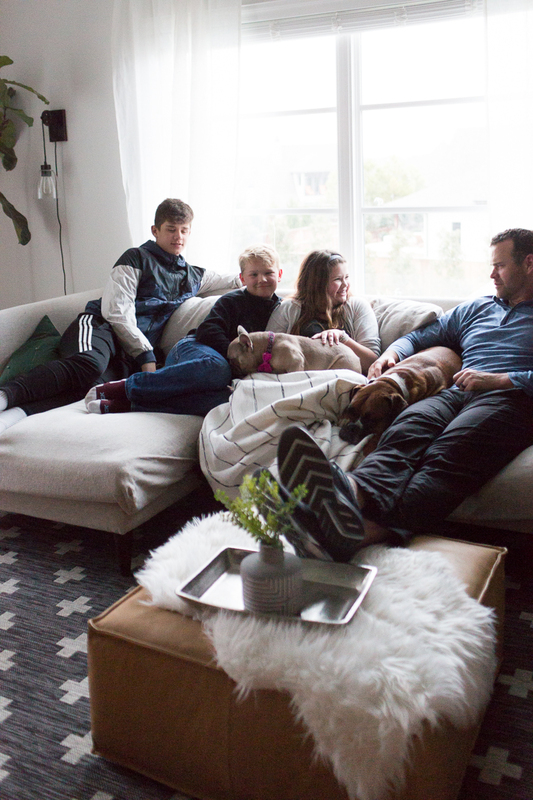 It was such a pleasure working with Joybird and their customer service was incredible as I was going through the process of custom ordering our sectional. They sent me fabric swatches that arrived so quickly and anytime I had a question, someone was there to help answer it and walk me through the process of ordering. What is my favorite thing about the Lewis sectional? COMFORT. It is so deep-seated that you can curl up and read a book on it or even sleep on it comfortably. 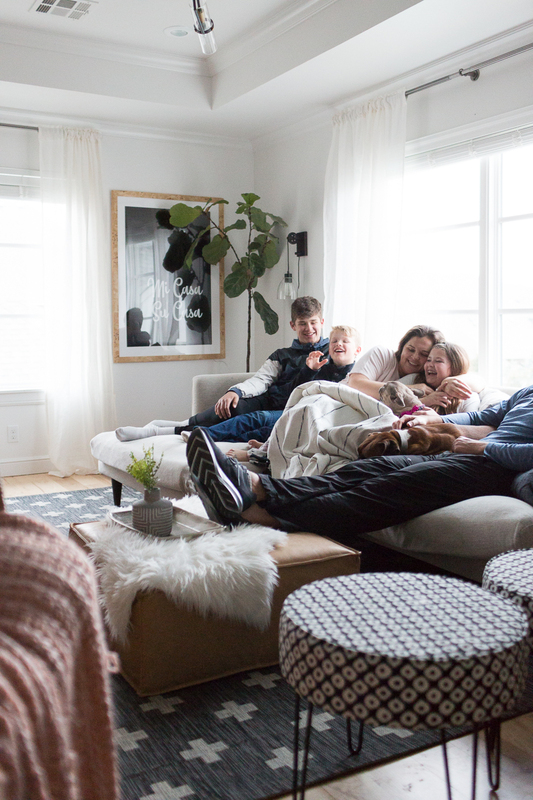 As you will see below, my entire family and the dogs can snuggle up on the couch and watch a movie together. It is also available to order in over 100 fabrics so there are a hundred (literally) fun things you could do with this couch from Merrit Dove (the fabric we chose that is just a light gray with slight specks in it) to bright and bold colors like Key Largo Coral and Taylor Tonic (a bright turquoise blue). If you’re needing a sofa for a larger space, the Lewis is available in a corner sectional unit as well. 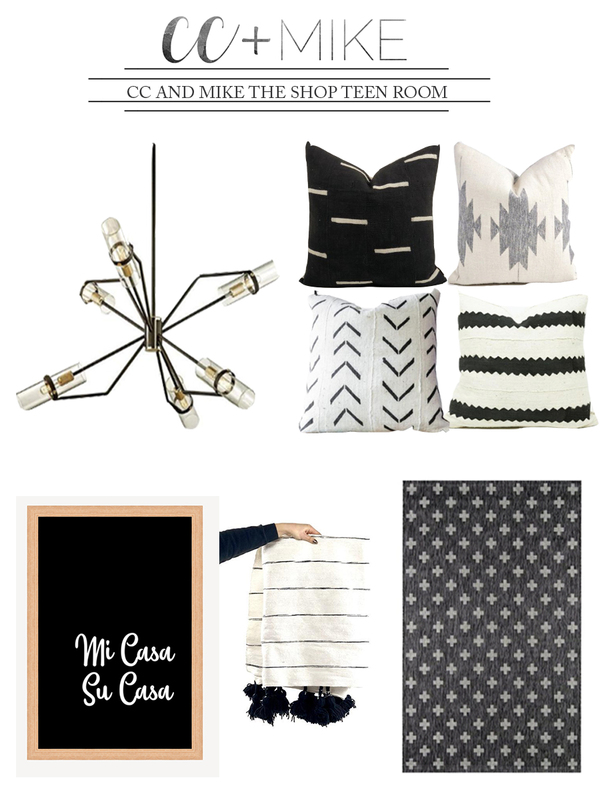 Let me share all the nitty gritty details of our teen room for you guys! 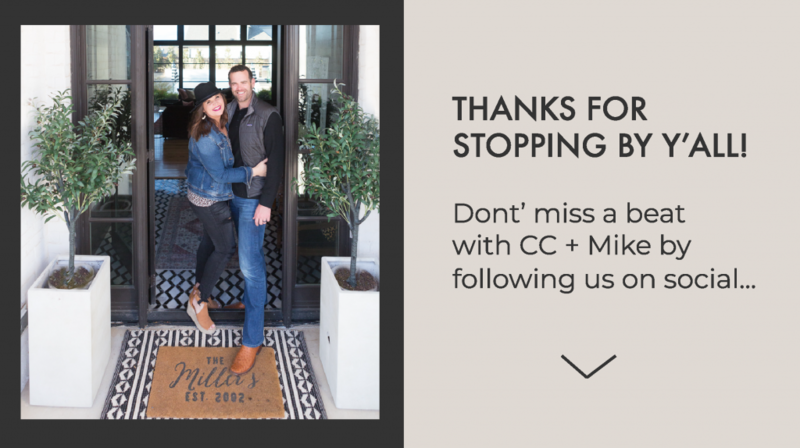 MI CASA SU CASA SIGN – EXCITING NEWS! 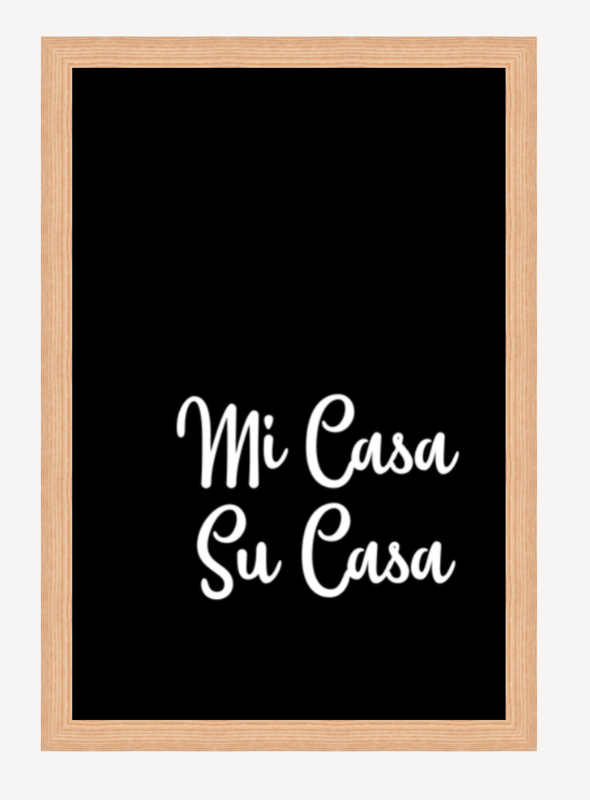 Our fun little Mi Casa Su Casa Sign is available in CC and Mike the Shop. You can buy it one of two ways: If you want it framed, you can buy it ready to go and it will ship right to your door. I recommend framing it in white, wood, or burl wood framing. It looks great with or without a mat. You can choose any of these selections in our shop once you select the print. The other new and exciting news is that it’s also available as a downloadable! You can pay $10 to download this print and just frame it yourself if you prefer to go that route! 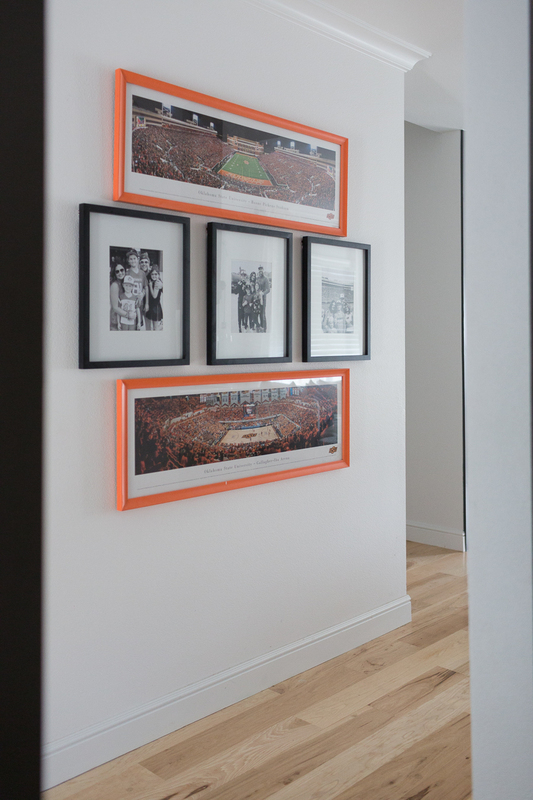 Whatever floats your boat (buying it framed already or just downloading it and framing it yourself), we got you covered! This framed print is the perfect piece of art to hang in any space from living rooms to hallways to guest rooms to dining rooms to teen hang out rooms! PILLOWS and THROWS – All the pillows and throws in our teen room are available in CC and Mike The Shop and are listed below! 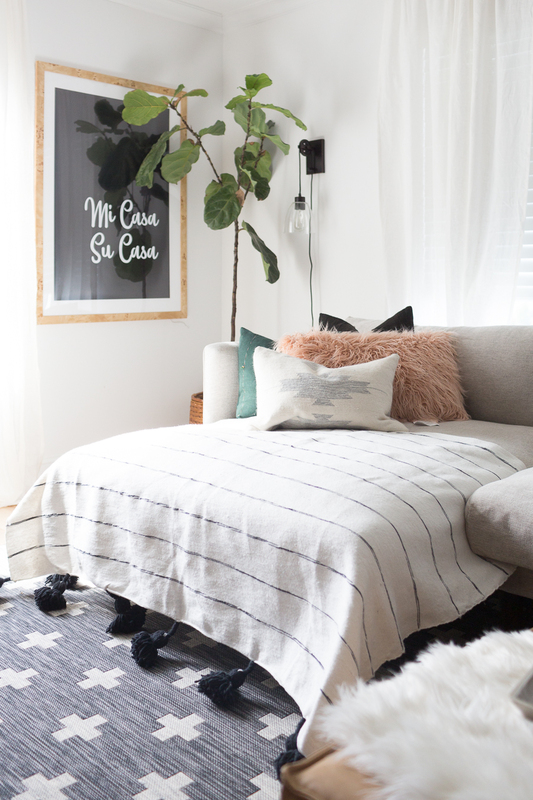 RUG – Charcoal Umbria rug from CC and Mike The Shop. 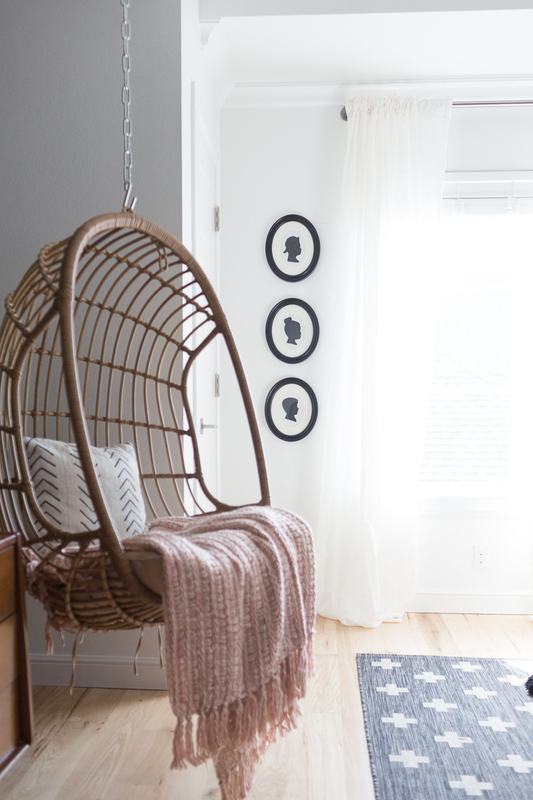 Hanging Chairs – I love these hanging chairs from Hayneedle so much that I wrote an entire post on them with some before pictures of this teen space! 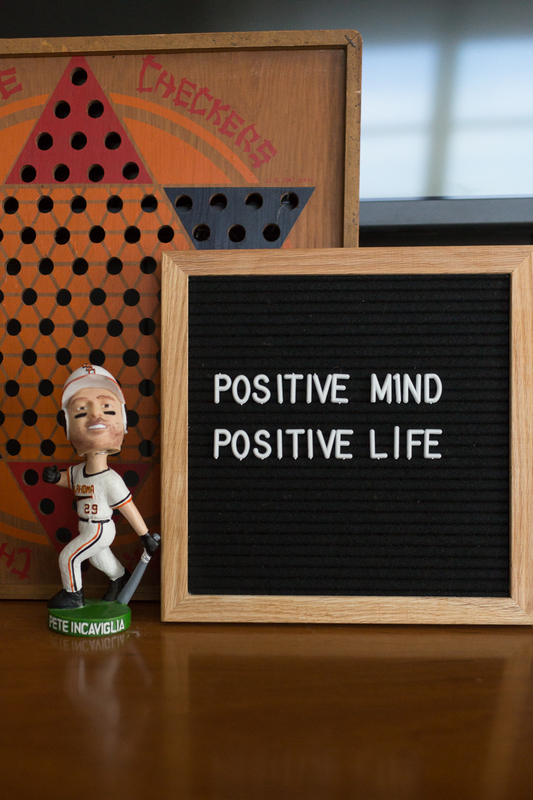 They are such a fun addition to any room and I have seen them used in master bedrooms, back and front porches, bedrooms, game rooms, and even living rooms. 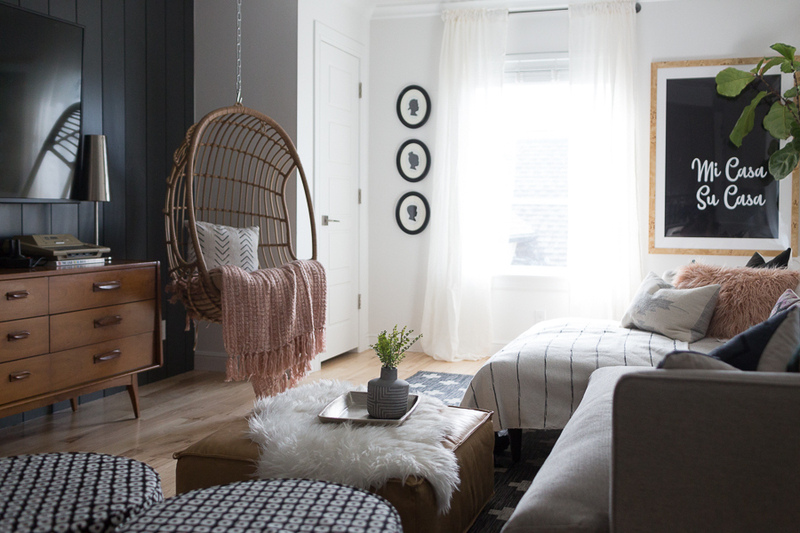 I highly recommend the chairs we have from Hayneedle and if you want to hang them from the ceiling don’t forget the hanging hardware. 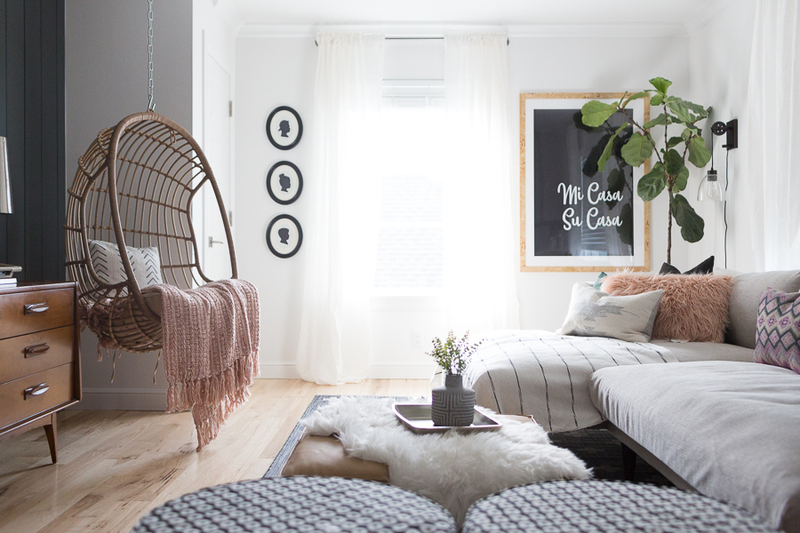 For more information on these chairs and how and where to hang them, make sure to read this full post. 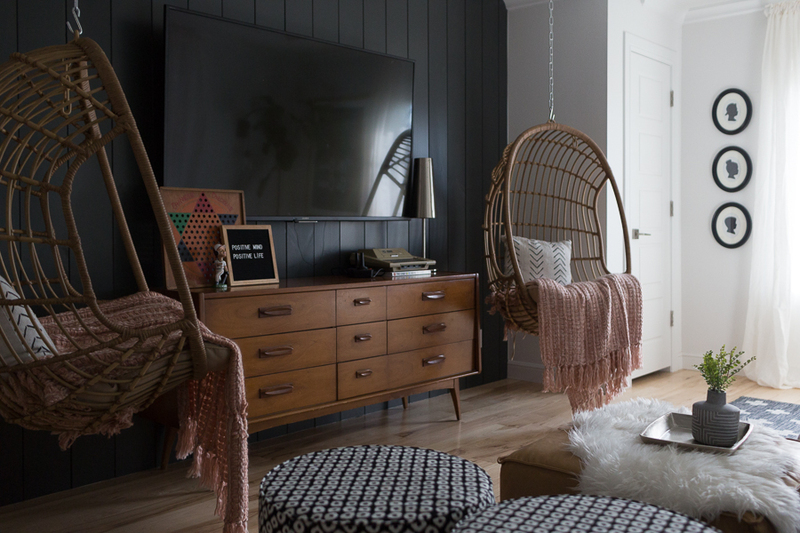 Ottoman – Another item of notable mention that I love in our teen room is also from Joybird. It is the Lyle Leather Ottoman, also from Joybird. 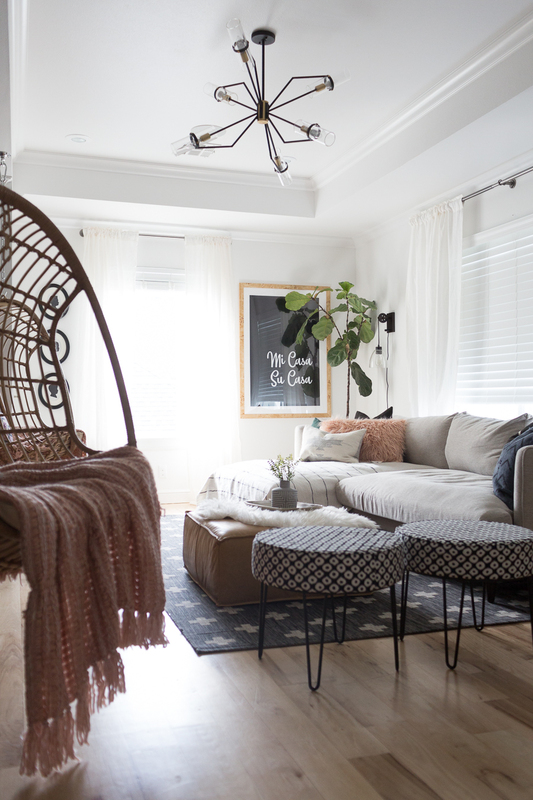 I love this ottoman and it’s perfect for a more casual space like our teen hangout room! LIGHT – The view below shows you our new light fixture for the teen room – The Raef Chandelier. It is one of my absolute favorite’s from CC and Mike The Shop. We also used this light fixture in our Frisco Project that we will be revealing soon and it’s quickly becoming one of our favorite light fixtures. 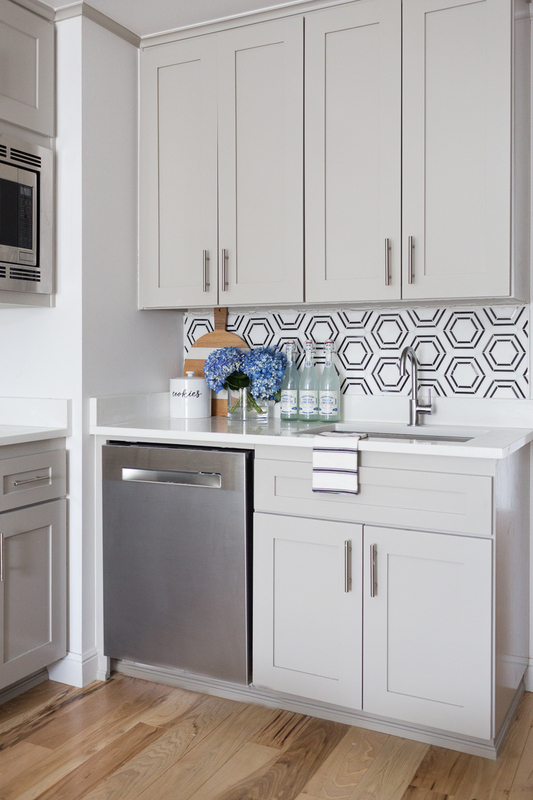 It instantly makes any space look modern and energized and it packs a punch in any room! 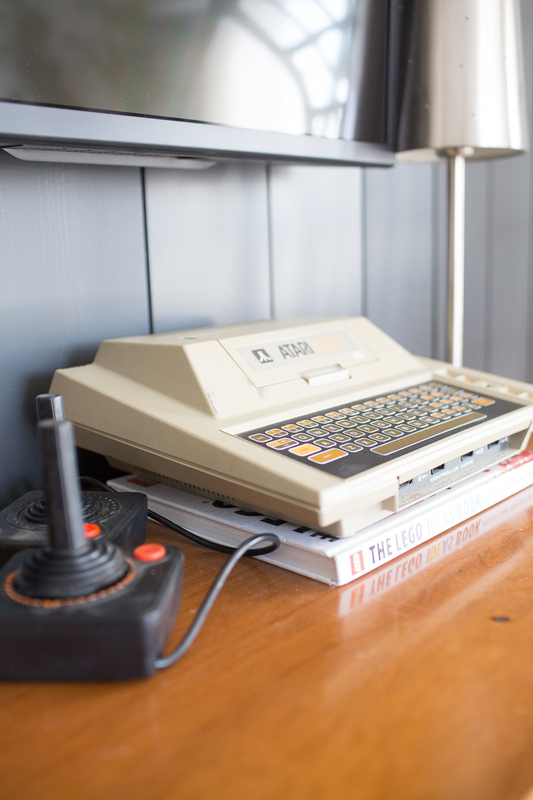 I highly recommend it for any space from living rooms to dining rooms to game rooms and entryways! These fun little Carman ottoman stools from Target were a must for the teen room! When our kiddos have friends over, they will need extra seating and I love how they can be moved around and used anywhere! My daughter and I had so much fun making these little silhouette frames. You guys, they only cost $5 and took us 5 minutes to make. We will be sharing the full DIY on how to make these soon!!! 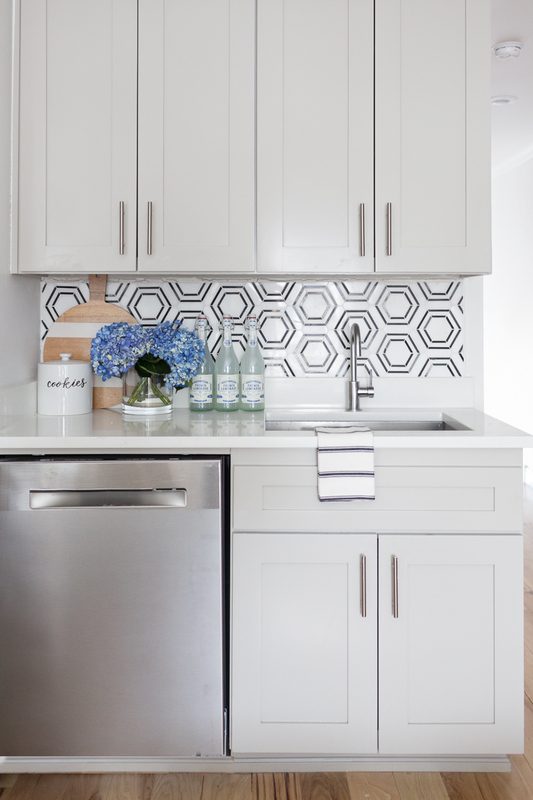 Our backsplash I’m IN LOVE WITH. 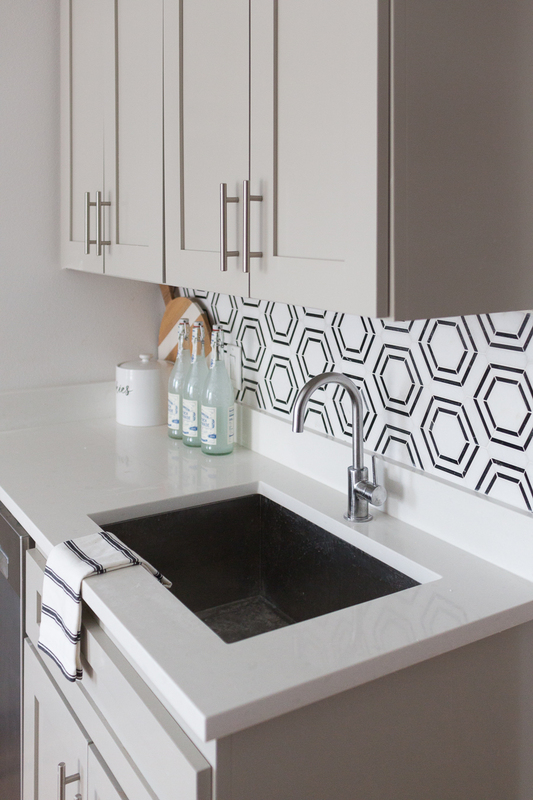 It is an affordable black and white marble honeycomb backsplash that is available from Home Depot. I think my favorite part though is that my boys installed the tile with my dad! 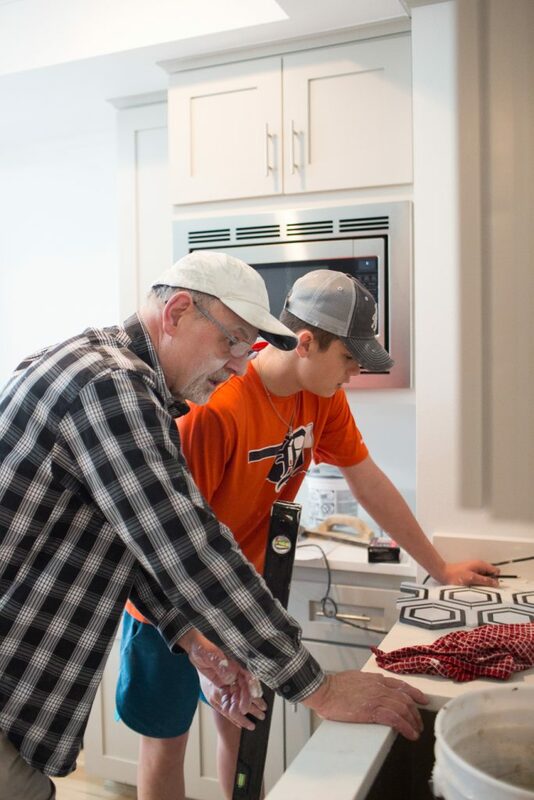 Oh and by the way, I have to mention that without a doubt, the best part of this project is the day that my son’s spent learning how to lay tile backsplash from their grandpa and their father. In fact, this picture brings tears to my eyes and I have so much to say….to much to say. So I will save that for another blog post coming soon. For now, just know that this…THIS right here is what it’s all about. My dad and my husband teaching the next generation how to work with their hands and accomplish something that they are proud of. All the feels. All the feels for this. So I wanted to give you an idea of where this teen room is in our house because I get a lot of questions about our floorplan. When you walk into our house off the garage, you walk into our downstairs game room which has an antelope staircase that leads upstairs. If you look at the picture below, you will see a second story balcony. That is a bunk bedroom with four bunk beds. 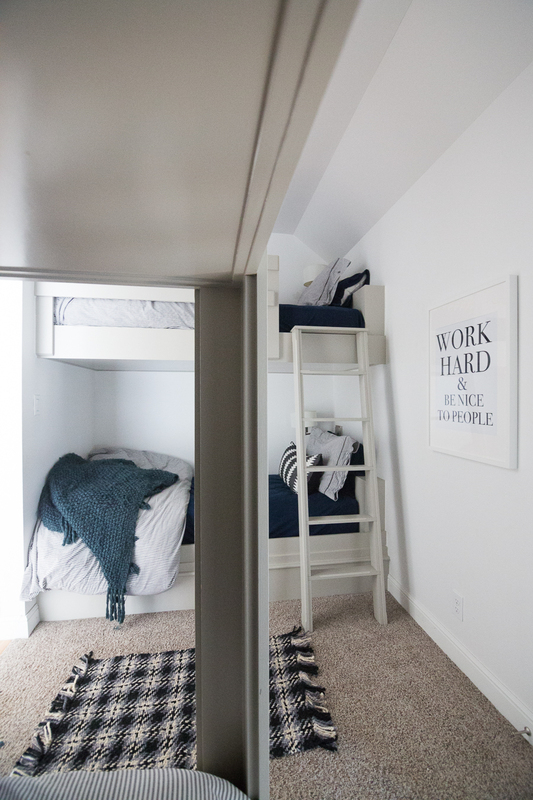 So if you walk through the game room, up the antelope stairs, and past the bunk bedroom, you will be in the teen room. 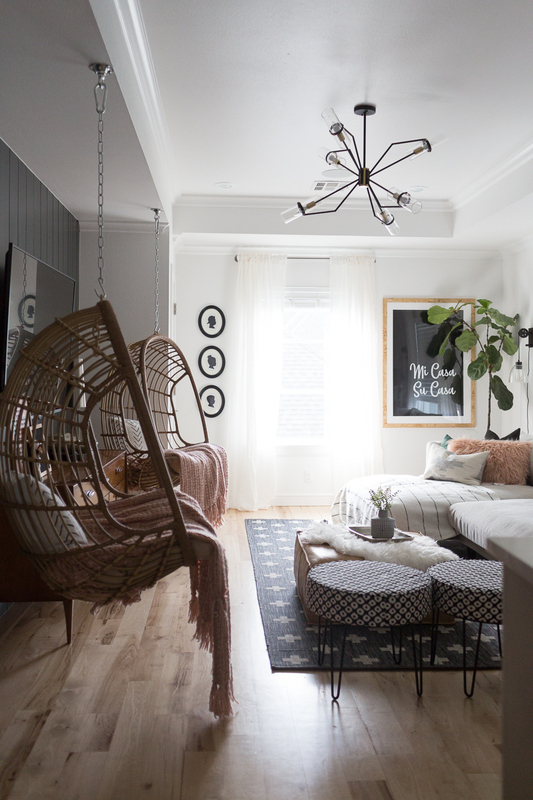 It is basically a small room or landing that you end up in before you go into our boy’s rooms. 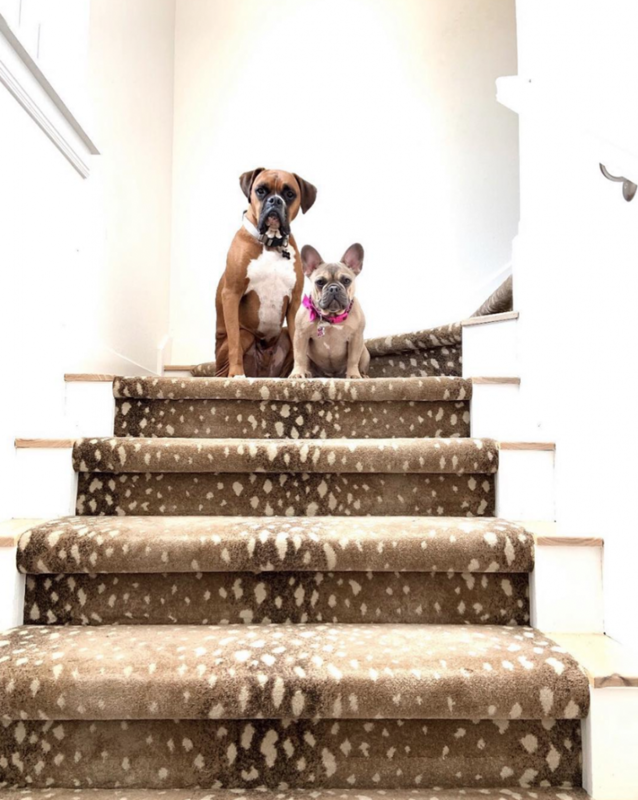 Oscar and Olive would love to invite you up the antelope staircase…. Down the hallway (of course we had to do a little collage of our favorite place on earth – Oklahoma State University) on the left hand side…..
And then on the right-hand side of the hallway, you can see our little bunk bed room…. And if you keep walking down the hall past the bunk bed room, you will find our teen room!!! 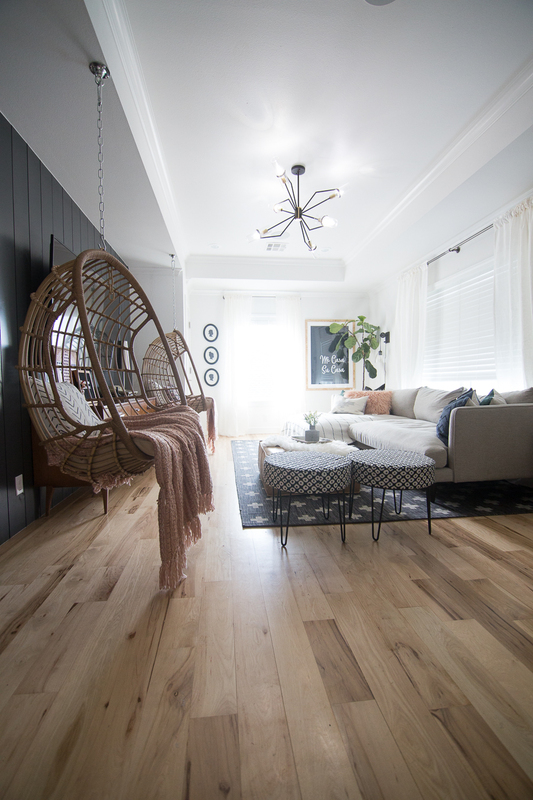 Thank you for stopping by the CC and Mike Teen Hangout Room Reveal with Joybird! 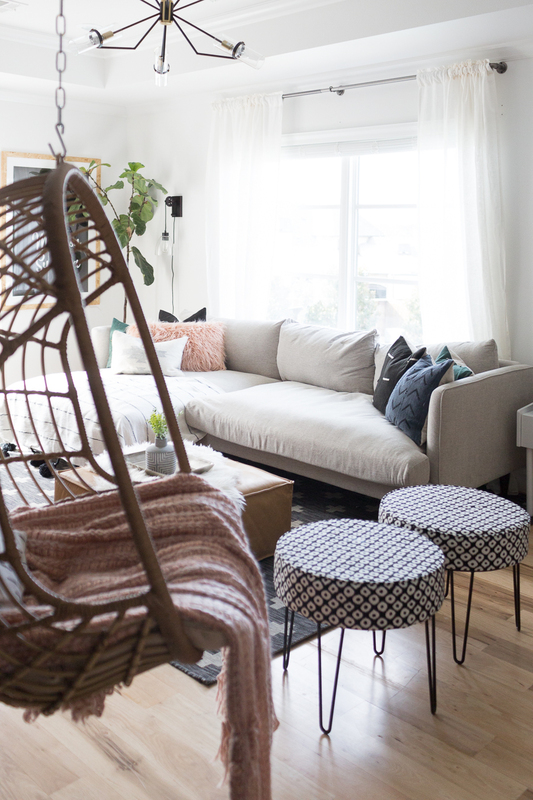 Hope this little post gives you some inspiration to start working on whatever little space is collecting junk in your house. It only took us almost 4 years, but better late than never right? !